This year, the Cherry Blossom Festival was so much fun! Last year it was difficult as Lily was at an awkward newborn age (10 weeks) and I couldn’t wear kimono long at all due to being a new nursing momma. This year, however, different story! I ended up wearing three different ensembles over Saturday and Sunday. I’m going to do three different posts as there’s a lot of photos. Quite a few months ago, I happened to stumble across an auction on Yahoo Japan Auctions for what appeared to possibly be a vintage wool kimono coat from the 1950s. I couldn’t tell 100% from the photos, nor was the word “kimono” mentioned in the auction – but I just had a feeling based on the collar and the way the sleeves were shaped. It was “Buy It Now” at 1000 yen – so I took a gamble. When it arrived – I was thrilled! It was indeed a kimono jacket! Not only was it a kimono jacket, it also had never been worn. It did have some dirt marks on it from the way it must have been stored, but being 100% wool, I felt comfortable with washing it in my washing machine (I used a mesh garment bag to protect it). It came out spotless! While looking at the jacket, I realized the soft pink matched a vintage 1950s hat I had, which had peony looking flowers. I knew immediately I wanted to pair them together – so to come up with the perfect matching ensemble. I decided upon my lovely lavender shishi on shishi iro tomesode (shishi on shishi because it has yuzen shishi on the front, and shishi rinzu!) and paired it with one of my favourite Taisho obi which had peonies on it. For those who may not already know – shishi are nearly always depicted with peony (botan). Additionally – the flowers on the obi matched in colour to the flowers on my hat! I finished the ensemble off with a lovely aqua coloured faux shibori han-eri with embroidered flowers, spring green date-eri, an aqua and white based obiage with dusty pink shibori and an aqua coloured obijime. Colourwise – everything matched beautifully. I was a little concerned that the weather might be too warm to wear the jacket, as it had been quite hot lately, however a cold front came in over the weekend and it was actually cool enough to wear the jacket! 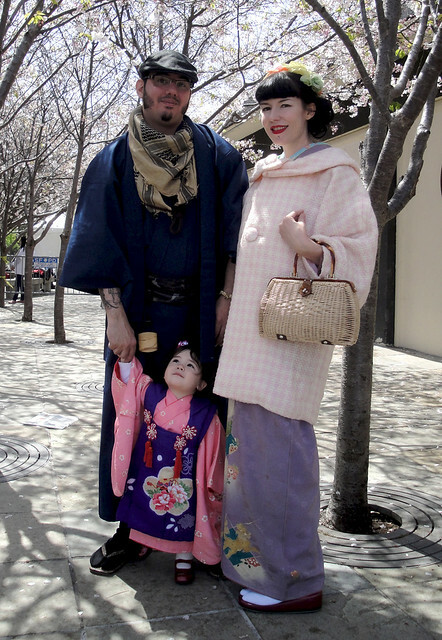 Arian wore his fantastic indigo tsumugi ensemble paired with his bat obi, scarf and hat and we dressed Lily in one of her furisode/hifu sets. Technically – the furisode/hifu are meant for a 3 year old (Lily is only 14 months old) – but I sewed a deep ohashori and tucks in the sleeves to make the furisode fit. Family photos under the sakura! Papa was Lily’s main mode of transport for the entire weekend. I loved the view from behind with Lily’s sleeves fluttering in the wind! I love this photo! If you look carefully – you can see Lily picking at the flowers on my hat, rather than looking at the camera! Haha! The following photos were taken after we had finished walking around and returned to the hotel for Lily’s Midday nap. It was extremely windy, so my hair ended up a little messy. All in all, I’m thrilled with how this ensemble turned out. I had a very specific vision in my head, and it executed well. The only thing I would change in the future would be my zori. I would have worn better matching ones, but my ankle is still very sore from being sprained, so I opted for comfort this time round.